Vacation Bible School has been a staple in children’s ministry for more than a century. Launched in 1894 in Hopedale, Illinois, what is now known as “VBS” has brought many children to Christ and ministered to their families—and it all started because a teacher wanted more time with his students. D.T. Miles, a Sunday school and public school teacher, felt limited by time constraints in teaching the Bible to children. Since one day a week wasn’t enough, Miles started a daily Bible school to teach children during the summer. A few years later, Children’s Ministry Director Eliza Hawes began what was called the “Everyday Bible School” in a rented beer parlor in New York City. Within a few years, Standard Publishing published the first VBS curriculum—a five-week course for three age levels. Millions of children now attend VBS, many hearing about Jesus for the first time. A 2014 study commissioned by Group Publishing found that 61 percent of churches in the United States offer Bible school. VBS programs are held around the globe—from Texas megachurches to tiny African villages. For most congregations, VBS is the largest children’s ministry outreach event of the year. In spite of cultural shifts and changes, the ministry model that started VBS more than a century ago is—at its core—still going strong. But can something developed in 1894 work for today’s kids? Is it worth the time for Christian retailers to train their staff and stock their shelves with VBS product? Is it worth the time, expense and effort for churches—or has it simply become cheap daycare for busy parents? Vacation Bible School is, in fact, one of the most valuable events a church can host. VBS is a prime ministry opportunity, plus it encourages Christian retailers to serve and connect with churches and families. One benefit comes from a ministry like VBS—everyone “gets it.” For many in America, Vacation Bible School is an instantly recognizable concept. Today’s VBS may be a far cry from what parents experienced 20 years ago. Churches may replace the term “VBS” with a more jazzy word like Camp, Club, Blast, Splash or Rock, but people generally know what to expect. Parents who may have attended VBS as kids trust that their children will get a morning or evening of safe, age-appropriate snacks, games, music, Bible lessons and crafts. 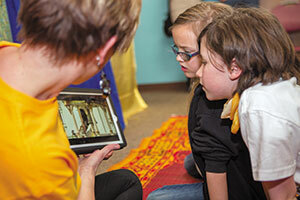 Children’s leader Sharon Stratmoen sees VBS as “a summertime staple” at her church in Minnesota. Because today’s parents don’t often take their children to church, VBS is vital in reaching kids. It’s no surprise that weekly church attendance in the U.S. is in decline. In a recent study titled Exodus of the Religious Dones, Josh Packard, Ph.D., categorizes people who have left the church but not their faith as “Dones” because they’re “done” with the organized church. How do these findings impact events such as VBS? Christian publishers, retailers and church leaders will continue to observe, but trends indicate that parents who may not attend church don’t necessarily have objections to their children attending special events. Perhaps this is due to positive memories of childhood experiences at VBS or because “Done” parents want to instill Christian beliefs and values in their children. Regardless of the reason, VBS may be one of the few times adults—or kids—set foot inside a church or interact with other faith-focused families. Parents of today’s elementary and preschool kids are, by and large, classified as millennials (born between the early 1980s and the late 1990s) and represent the largest generation in history. A 2014 study by The Council of Economic Advisors, 15 Economic Facts About Millennials, found that millennials value family. Recent research indicates they’re living out that value by putting their kids first. For instance, young couples will strategize and shift work schedules so one parent is always home with the kids. Millennial parents are involved in their children’s lives and love spending time with their kids. Family-friendly community events like VBS have a strong appeal with this demographic. VBS provides five days to showcase how much the church values kids, demonstrating this to millennial parents with family values. VBS is the time for children’s ministry to shine, showering love and attention on kids. Parents are taking note! They enter a church and see elaborate decorations, trained staff, quality music and graphics—all done to welcome and serve their children. Such an effort speaks volumes. While year-round schools continue during the summer, most schools are out in June, July and August. Kids have a lot of time on their hands, and parents are looking for ways to fill those hours. Summertime gives churches a unique window of opportunity to provide activities for kids and respite for parents. Parents who seek ways to get their kids outside—and away from “screen time”—view VBS as a positive, social, active option for their kids. Millennial parents are conscious of health, exercise and wellness, and they want their kids outside running and playing. Therefore, a morning or evening at VBS is a welcome occasion for kids to be active. These days VBS looks less like school and more like a trip to Disneyland. Publishers are making it easier than ever for churches to promote and present a quality Bible school event. A morning or evening of VBS is filled with skits, snacks, upbeat music, high-energy games, videos, themed apps and games, over-the-top decorations and even explosive science experiments. Packaged curriculum gives busy volunteers—many of whom give up personal work and vacation time to help—all of the resources they need to share the wonder of God’s love with tech-smart, visual kids. These resources also make it easy to tailor events for active families. In 1894, VBS might have lasted all summer long. As recently as 1998, publishers offered 10-day programs, but churches are now responding to the lifestyles and schedules of busy families, tailoring their VBS programs to fit those needs. Models such as weekend VBS, family VBS, backyard Bible clubs, sports camps or all-day camps make outreach even more appealing to kids and their parents. Planning and executing VBS is no small task. Church leaders and volunteers spend countless hours recruiting, planning, training, budgeting, advertising and decorating for only five days of programming. Thankfully, publishers have stepped in to support churches by providing practical resources to make their jobs easier. Gone are the days of clunky clip art or do-it-yourself graphic design. Most VBS programs include customizable forms, web page templates, planning calendars, recruiting commercials and even mobile apps. These resources give VBS leaders a leg up in making their event stand out. Savvy retailers will be sure to carry and promote resources that save time and give the church the tools needed to stand out among many summer options for kids. VBS is all about relationships—relationships between family members, church members, people in the community and, ultimately, between a child and God. Parents from the community who are dropping off or picking up their kids have a chance to connect with Christian parents. Leaders get to be the heart and hands of Jesus to the kids who attend. Church kids get to form friendships with other kids in the neighborhood. Suddenly, the church isn’t just a building to drive by. The church is people who care, smile, hug and welcome. The personal connection is transforming—possibly more than all the memory verses and Bible lessons. Few outreach events give the focused time and attention to parents and children that VBS can offer. Jody Brolsma is the VBS executive editor at Group Publishing in Loveland, Colorado. She has been doing what she calls “the funnest job in the world” for more than 20 years.